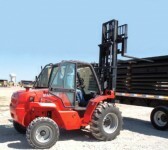 The M-X Series of Manitou forklifts are about as tough as they come! 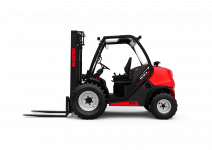 Available in 3.0, 5.0 and 7.0 tonne capacity, these machines offer easy-to-operate features, 360-degree visibility, exceptional ground clearance and a 4.0-metre lift height. If you need to ‘go anywhere’ and ‘lift anything’, the M-X Series could be the machine for you. Talk to us today about your rough terrain options. Manitou’s 4WD 2.0 and 2.5-tonne capacity off-road range of machines will get your jobs done with no fuss! Featuring industry-leading ability over the toughest terrain, the 4WD system will keep your job and your operators safe. MH Series Buggies are easy to control and offer a lifting height of 3.3 metres, making them ideal for minesites, construction sites or anywhere that additional traction is required. For further information, contact the LiftRite team today. 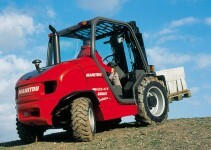 Manitou’s MSI range is specifically designed to operate on less-than-ideal surfaces such as gravel or compacted dirt. The range is available in capacities from 2.0 to 5.0 tonnes, with units up to 4.0 tonnes having a cabin height of just 2.3 metres. 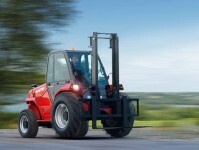 Low clearance combined with a small turning circle makes the MSI forklift the ideal choice in confined spaces. This range of machines is equipped with Kubota diesel engines for excellent reliability.